With six seasons of TV and a movie hitting theaters in 2017, LEGO’s original ninja setting has lasted far longer than I expected. 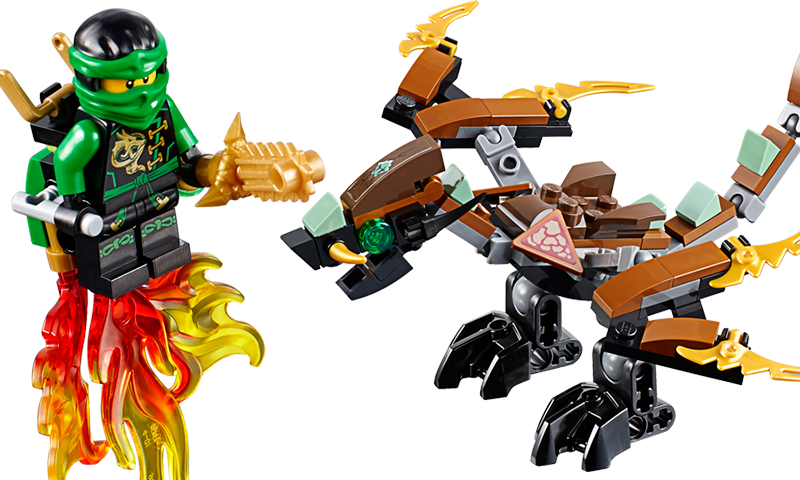 Here’s a first look at the new Ninjago sets hitting stores on March 1. I guess kids young and old just really love ninjas. Or maybe it’s the specific combination of ninjas, dragons and future tech that LEGO’s used to build Ninjago into an entertainment powerhouse. While I trudge sadly through LEGO stores looking for discounted Chima products (R.I.P. animal battles line), Ninjago fans excitedly scroll down to check out the pirates VS. ninja aerial battles in the new building sets. Cole’s Dragon — $9.99 USD — 98 pieces — Pose the neck, wings and legs of the dragon and fly into attack. Defeat the sky pirate and free trapped Zane from the special Djinn Blade! The Cole’s Dragon set serves on of two purposes. At $9.99 it’s either the set you purchase when you don’t have enough money for anything else, or the set you purchase when you’ve spent a lot on the other sets and another $10 isn’t going to make much of a difference. Ninja Bike Chase — $19.99 USD — 231 pieces — Target the sky pirate’s flyer with Kai’s bike’s hidden cannons/boosters. Dodge the flyer’s bombs and aim the elemental water cannon from Nya’s awesome bike. Take his flyer down then fold out Kai’s bike’s golden Ninja blades to attack. You must defeat Sqiffy and free Cole from the Djinn Blade! The Ninja Bike Chase set is an excellent value in terms of NPB—Ninja Per Box. You get Nya, Kai and technically also Cole, whose tiny soul is trapped in that Djinn Blade. Sky Shark — $19.99 USD — 221 pieces — Send up the drone to check out this awesome jet with dangerous blades, guns and loads of cool pirate details. And beware—the Sky Shark could drop dynamite or rotten fish at any moment! Then convert the drone into a jetpack for Lloyd and launch the Ninja hero into battle. Bring down the Sky Shark and fight to free trapped Kai from the Djinn Blade! The second $19.99 set only features one ninja, but his name is Lloyd and his feet are on fire. Ninja Lloyd is pretty much the best. Jay’s Elemental Dragon — $29.99 USD — 350 pieces — Jump into the dragon’s saddle and grab the reins. Snap the jaws and adjust the head, wings, legs and tail for awesome battle poses. Dodge Cyren’s harpoon hook shooter and the pirate flyer’s six-shooting rapid shooter. Fire the spring-loaded shooters to take down the flyer and then release Nya from the Djinn Blade! Ninja Jay gets his own elemental dragon in the release, making Cole’s stupid little $9.99 dragon look like it’s from K-Mart. Raid Zeppelin — $29.99 USD — 294 pieces — Swerve clear of the Zeppelin’s powerful cannons and dynamite dropped through the trap door. Fire the flyer’s elemental ice stud shooters and board the airship. Face-off against the Doubloon and Clancee to grab the Djinn Blade and free your fellow ninja warrior Jay! Raid Zeppelin is incredibly close to Led Zeppelin, making this set the perfect gift for the classic rock fan in your life. Tiger Widow Island — $49.99 USD — 450 pieces — Mighty Dogshank is approaching carrying her huge anchor weapon. Fight back with Nya’s katana and drop coconuts on Dogshank from the tower and Sensei Wu’s hot air balloon. Watch out for Sqiffy’s pirate flyer and make the palm tree fall to knock him off the ladder. Hide out in the cave—and beware of the giant venomous spider roaming the island! Defeat the pirate invaders and free trapped Lloyd from the special Djinn Blade! Behold Tiger Widow Island, a land of ninja and pirates and palm trees. A land without land. Features a character named Dogshank, which is a crude knife made out of a dog. Misfortune’s Keep — $79.99 — 754 pieces — The evil Djinn Nadakhan and the crew of Misfortune’s Keep are threatening to destroy Ninjago. Soar sky-high with Lloyd’s booster jet and operate the winch to lower Jay into battle. Beware of Misfortune’s Keep’s hidden cannons, disc shooters and the pirate jet taking off from the launchpad. Can you help the Ninja to defeat Nadakhan and free trapped Wu from the golden Djinn Blade? Finally we have this beautiful thing. Misfortune’s Keep has been on the LEGO Store page for a bit, so fans already know what it looks like. It’s a flying fortress that is only a few steps away from being co-opted into a Final Fantasy airship fan build. These sets and more will be on display at Toy Fair 2016 in NYC this weekend, as well as absolutely no new LEGO Chima stuff, because LEGO hates me and loves to see me cry.